Daylight savings time took away an hour of our morning, so I decided to save a little time and run indoors. My wife was doing her workout on the elliptical machine, so I accompanied her on the treadmill for the last 35 minutes of her session. My plan was to run for an hour or for 5.7 miles, whichever came first. I started off at a very easy pace, because I'd run long on Saturday and didn't want to push my already tired legs. I moved along feeling great, but after 25 minutes I began to noticeably weaken. I realized that it would be a struggle to complete my full hour and I started to reevaluate when I would stop. After my wife finished her workout, I thought I would continue, but only for another ten minutes. I'd wished that I'd had a gel to give me a boost at that point, but as it happened, I didn't need it. When I reached 43 minutes, I started feeling stronger. My urgency to stop had completely gone away. It suddenly felt easy, for no reason that I could explain. The only thing I could think of was that my body had depleted my glycogen stores and had started using stored fat as an energy source. Everything I've read tells me that this transition doesn't happen until you have run for an hour or more. Before you feel good, you're supposed to feel very bad. I hadn't been comfortable for a good amount of time, so perhaps that explanation is plausible. All I knew was that, suddenly, the run became as easy after 45 minutes as it was after 5 minutes. I decided not to stop and took advantage of my rebound by bumping up the speed and focusing on my form. I reached my goal (originally 5.7 miles so that I would surpass 13 miles this weekend) but kept going until I passed 6 miles. It was a tiring run but, hours later, I still feel energized. 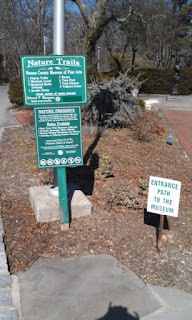 Later in the morning we went to the Nassau County Museum of Art and walked the grounds before we went in. 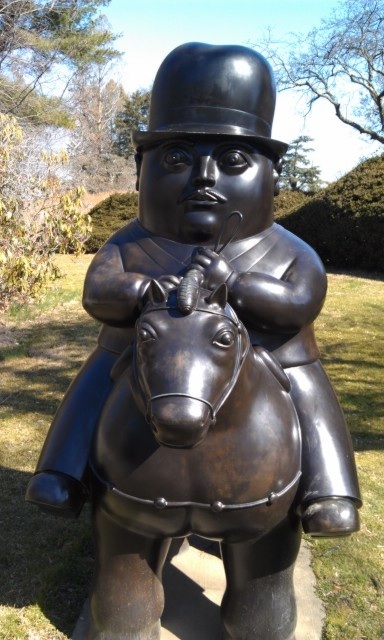 The museum has 39 large sculptures located within its grounds (AKA, the William Cullen Bryant Preserve). There are many trails to follow and we plan to return just to do that. I'm pleased that I met my goal of covering 13 miles this weekend. That will help me push my base as I train for the LI Half Marathon. Best of all, I get to rest tomorrow. But it all starts again on Tuesday.